Greeley’s Water Conservation program is continuing to offer its popular Landscape Lecture Series. The goal of the workshops is to promote sustainable landscape practices in the community. Join us on the third of the month Wednesday beginning at 6 p.m. The location for these events is the Greeley Recreation Center, 651 10th Avenue. 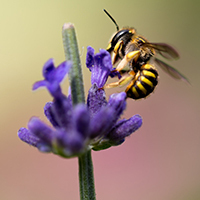 The next workshop is The Birds and the Bees: Natural Areas on July 18. Four short lectures will provide information on how to give the vital habitat elements in landscapes whether at home, work, school, church or business. On August 15, we are featuring an Update on the Emerald Ash Borer. Learn what to look for on your trees. As well as, what you can do to help protect your property. The confirmation of Emerald Ash Borer in Boulder County (Boulder, Lafayette, Longmont, Gunbarrell, and most recently in Superior) warns of the unavoidable introduction of a new tree pest to Greeley. This infestation could adversely affect thousands of Ash trees in our community. City of Greeley Forestry Manager, Shiloh Hatcher is the presenter for this workshop. The classes are free, but RSVPs are required because space is limited. Please visit greeleygov.com/LandscapeLectures to reserve your seat and to get additional information.